After two weeks of mites, their diets and pedantry we’ll take a break this week for some practical beekeeping. Or at least as close as you can get to practical beekeeping when it’s been as cold as -8°C. 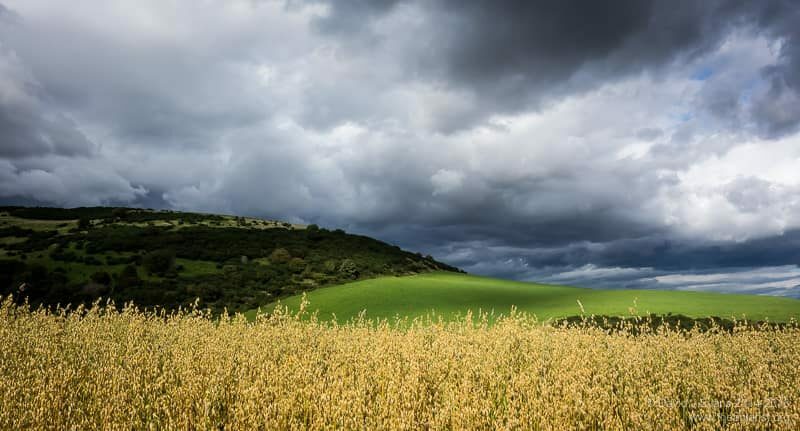 Midwinter is a time to prepare for the season ahead, to stock up on new equipment during the winter sales, build more frames, plan the strategy for swarm control and think about stock improvement. 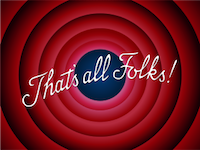 And – if you’re anything like as disorganised as me – it’s also the time to tidy up after the season just finished. Which is what we’ll deal with today. 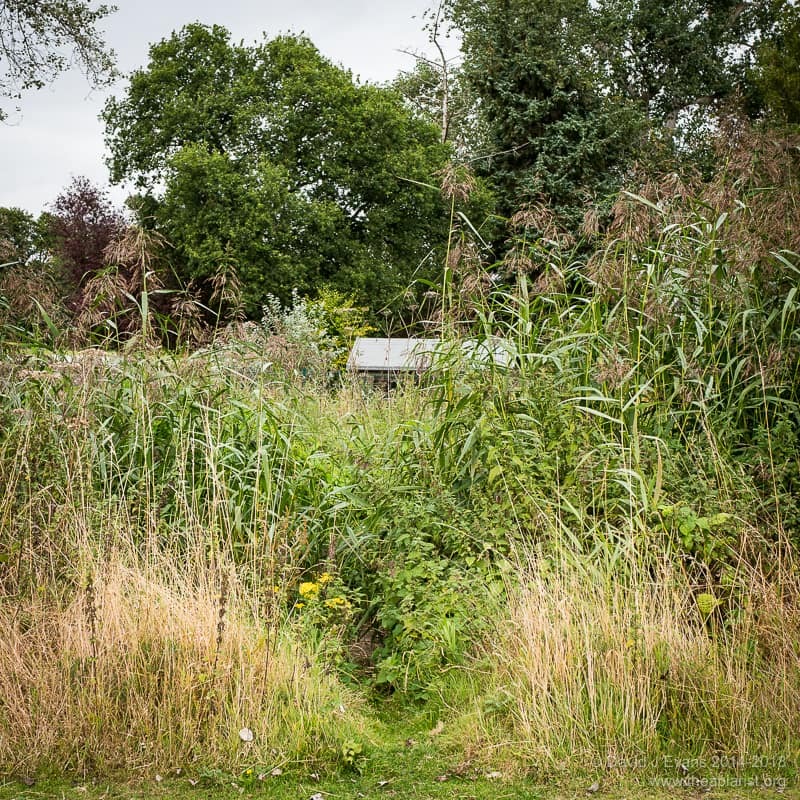 The original research apiary and bee shed is now under an access road for a new school. Fortunately, we managed to rescue the shed which has now been re-assembled in the new apiary. In the longer term these sheds could together accommodate at least a dozen full colonies. 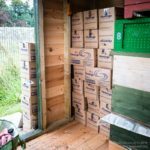 However, in the shorter term it has allowed me to rationalise the storage, giving much more space to work with the colonies in the larger shed. 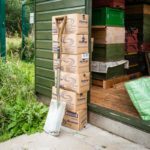 Supers and brood in the storage shed have all been tidied (see below) and are in labelled stacks ready to use. The other side of the store contains stacks of floors, split boards, clearers and roofs. It’ll get messier as the season progresses, but it’s a good start. 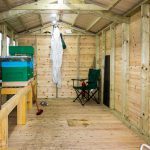 I also spent a couple of weekends making some minor improvements to the bee shed following the experience last season. The lighting has been increased and repositioned so it is ‘over the shoulder’ when doing inspections. On a dull winter day it is dazzlingly bright 1 but I fear it will still not be enough. I’m looking at creating some reflectors to direct the light better. I’ve also used a few tubes of exterior sealant to block up all the holes and cracks around the edge of the shed roof. Last season was a bad one for wasps and we were plagued with the little stripy blighters. Two of the most valuable resources a beekeeper has are drawn super frames and capped stores in brood frames. I often end up uniting colonies late in the season, but then overwinter the bees in a single brood box. This means I can end up with spare frames of sealed stores. These should be protected from wax moth and mice (or anything else) as they are really useful the following year for boosting colonies that are light on stores or making up nucs. Drawn supers can be used time and time again, year after year. 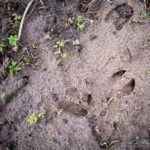 They also need to be protected but – if your extraction is as chaotic as mine – they also usually need to be tidied up so they are ready for the following season. I load my extractor to balance it properly, rather than just super by super. Inevitably this means the extracted frames are all mixed up. Since frames are also often drawn out unevenly this leaves me with a 250 piece jigsaw with billions of possible permutations, but only a few correct solutions. And that’s ignoring all the frames with brace comb that accumulate during a good flow. So, in midwinter I tidy up all the cleared super frames, levelling off the worst of the waviness with a sharp breadknife, removing the brace comb, scraping down the top bar and arranging them – 9 to 11 at a time 2 – in supers stored neatly in covered stacks. And, if you’ve got a lot, label them so you know what’s where. 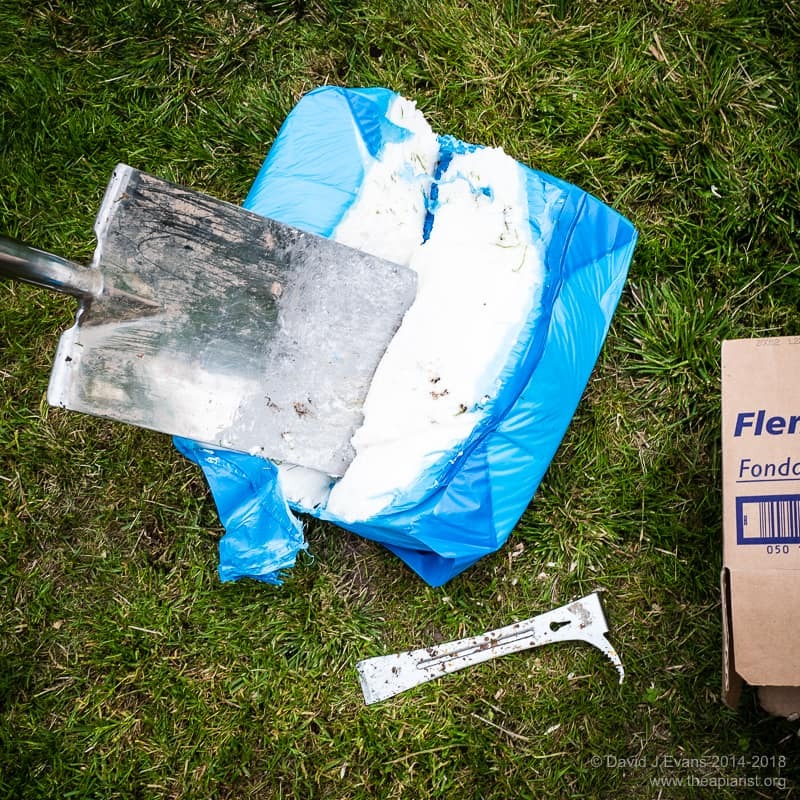 An hour or two of work on a dingy midwinter day can help avoid those irritating moments when – in the middle of a strong flow – you grab a super to find it contains just five ill-fitting frames, one of which has a broken lug. The wax removed during this tidying up is usually lovely and white. Save it for making soaps, cosmetics or top-quality candles. Brood comb has a finite life. After about three years of repeated brood rearing cycles it should be replaced. 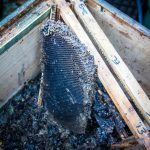 Old comb contains relatively little wax but what’s there can be recovered using a solar or steam wax extractor. This also allows the cleaned frames to be re-used. 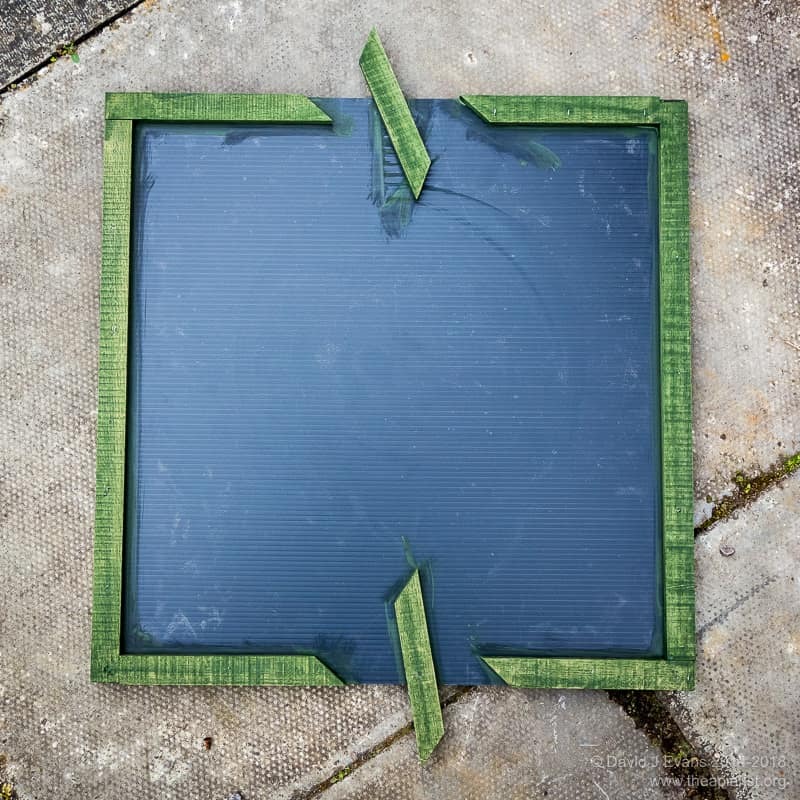 Processing a few dozen brood frames with a solar wax extractor during a Scottish winter is an exercise in futility. 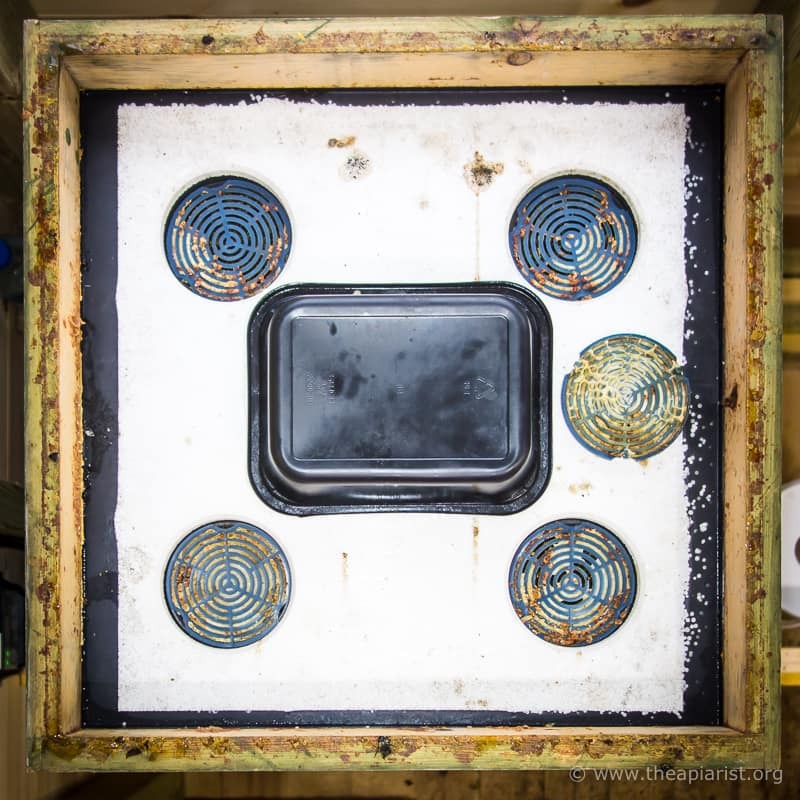 For years I’ve used a DIY steam wax extractor which worked pretty well but was starting to fall apart. I therefore recently took advantage of the winter sales and purchased a Thorne’s Easi-steam 3. 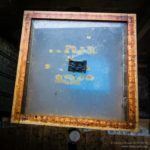 The Easi-steam works well and with a little further processing generates a few kilograms of wax for making firelighters or trading in … and a large stack of frames for re-use. 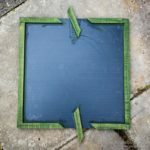 Remember to keep a few old dark brood frames aside for using in bait hives. In between all these winter chores don’t forget to check on your bees. There’s not a lot to do, but these checks are important. Make sure the entrances are clear, that the mouse guards 4 are in place and that the roofs are secure. 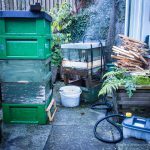 Storm Eric brought us 50-60 mph winds and a couple of my hives lost their roofs. These had survived a couple of previous storms, but the wind was from a different direction and lifted the roofs and the bricks stacked on top. I got to them the following day but we’ll have to wait until the season warms up to determine if there’s any harm done. 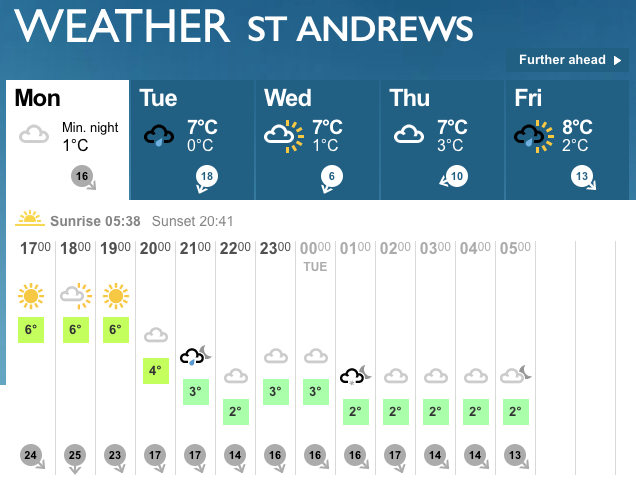 Finally, as the days lengthen and it gets marginally warmer colonies should have started rearing brood again. Make sure they have sufficient stores by regularly ‘hefting‘ the hive. If stores are low, top them up with a block or two of fondant. 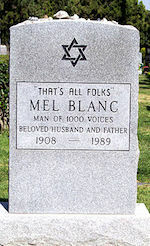 This should be placed directly over the cluster, either over a hole in the crownboard or on the top bars of the frames. 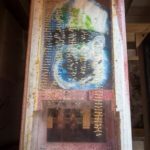 This entry was posted in Bee shed, Beekeeping, Feeding, Frames, Hive products, Seasonal, Wax and tagged Easi-steam, fondant, wax on February 15, 2019 by David. 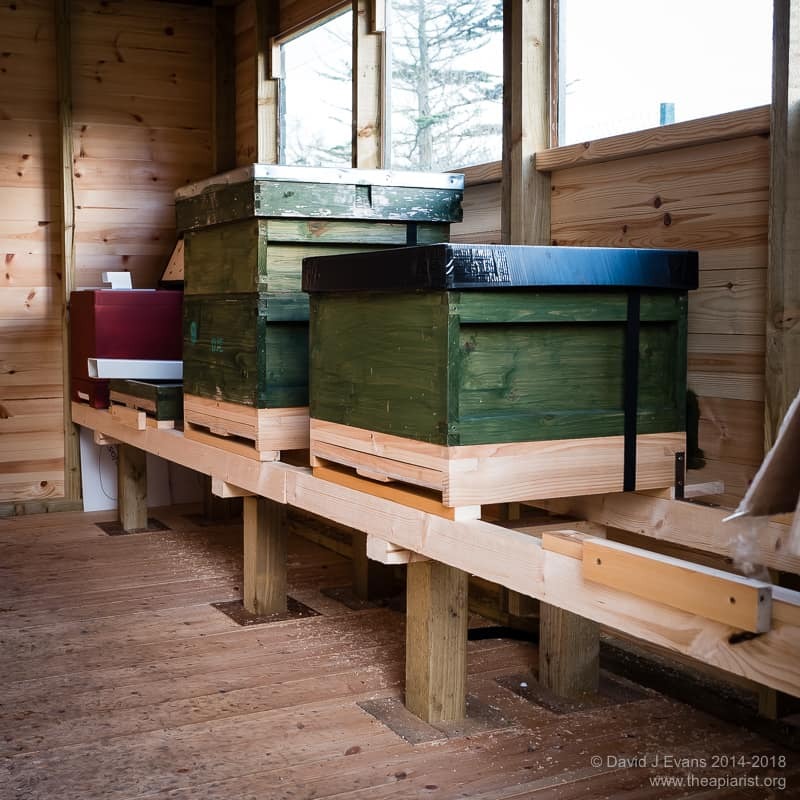 Perhaps surprisingly if the weather is still very wintery, inside your hives brood rearing has probably started 1. 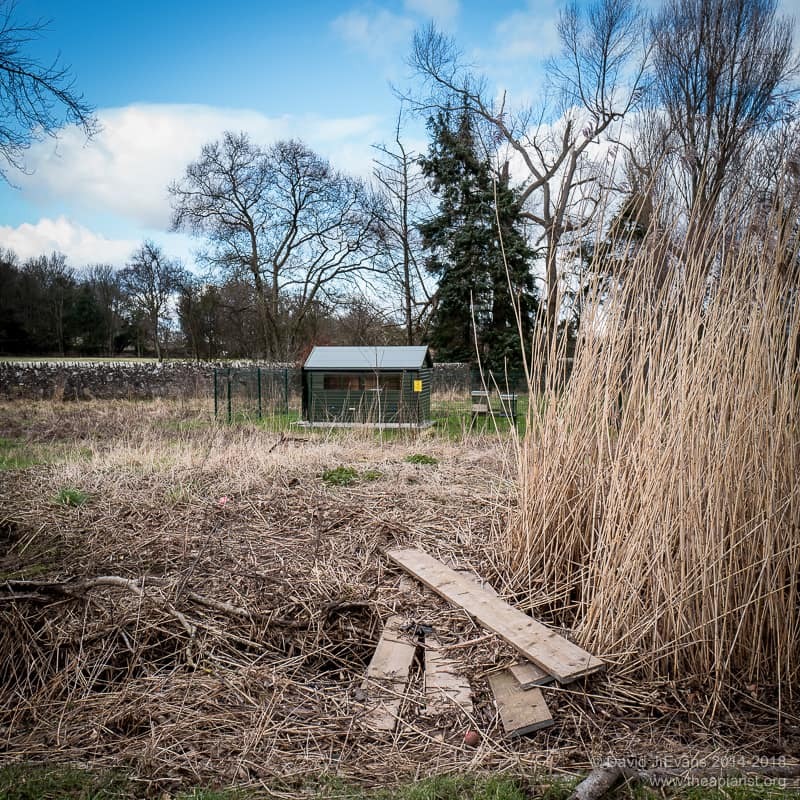 It’s about half way through the winter, there’s no forage available and the colonies are surviving on the stores they laid down in the autumn last year. But now they have a few more mouths to feed … as a consequence, they’re likely to start using the stores at a higher rate. 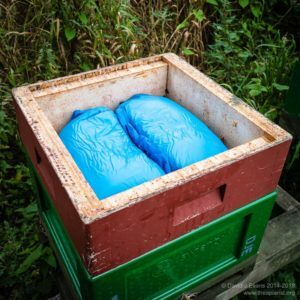 I’ve recently written about the importance of hefting hives in the winter to judge (very approximately) how much stores they have remaining. It’s an imprecise science at the best of times, but it is important to ensure they don’t run out. If they do, the colony will starve to death. 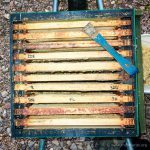 If the colony is feeling a bit light you need to give it sugar as soon as practical and as close to the clustered bees as possible. The most convenient type of sugar to give is bakers fondant. This is the same stuff you get on Chelsea buns. 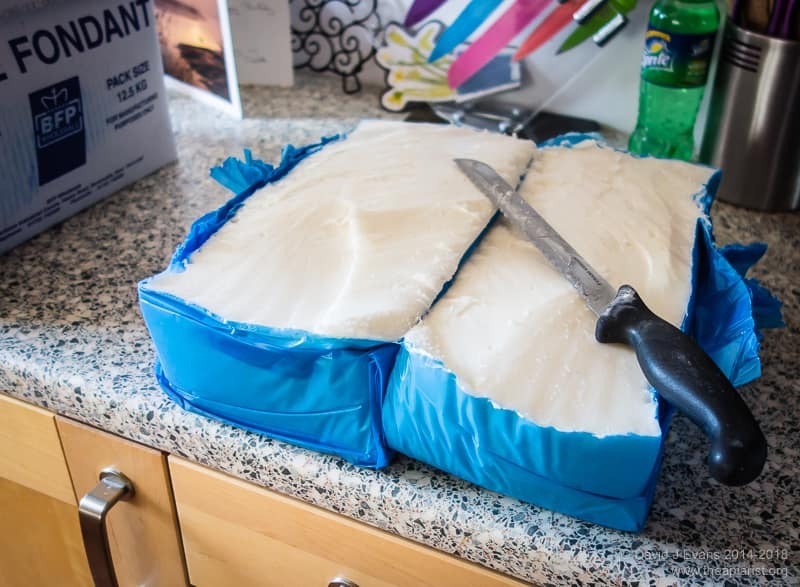 You can buy fondant in 12.5 kg blocks for about a tenner (in bulk … one-off purchases are likely to be more expensive) from wholesale suppliers. Fondant keeps well for several years and so it’s worth stockpiling some for emergencies. 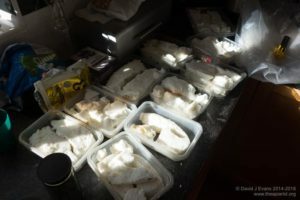 Since I use fondant for all my autumn feeding as well I buy in bulk (200+ kg) every year or two and stack it somewhere safe, dry and protected from vermin (and other beekeepers 😉 ). Feeding fondant can be as simple as cutting a thick slice of fondant off the block and laying it across the top bars of the hive. You’ll need an eke or a reversible crownboard to provide the ‘headspace’ over the colony. Replace the roof and any insulation and the colony should be OK … but don’t stop checking for the rest of the winter. It’s not worth adding a measly few ounces of fondant. If it’s midwinter and the colony is already light, a couple of hundred grams is going to only last a few days. Don’t be stingy. Add at least a couple of kilograms. Don’t wait for a balmy midwinter day to add the fondant. Add it as soon as you realise they’re light. It won’t harm the colony to open it up for the few seconds it takes to add the block. Add the fondant as close to the clustered bees as possible. A small cluster cannot move far in very cold weather. Even inches is too much. There are few sights more tragic than a cluster of starved bees just a few centimetres from lashings of sealed stores or a large lump of fondant. 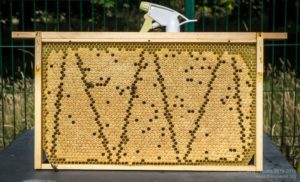 Finally, don’t spend ages clearing bees off the top bars with little puffs of smoke. The colony will be getting chilled and the disturbance will be worse than the loss of the few bees you might inadvertently squash under the fondant block. Think of the greater good … speaking of which. When I feed colonies in the autumn I simply slice a complete block of fondant in half with a spade, open it like a book and lay it on top of the colony. 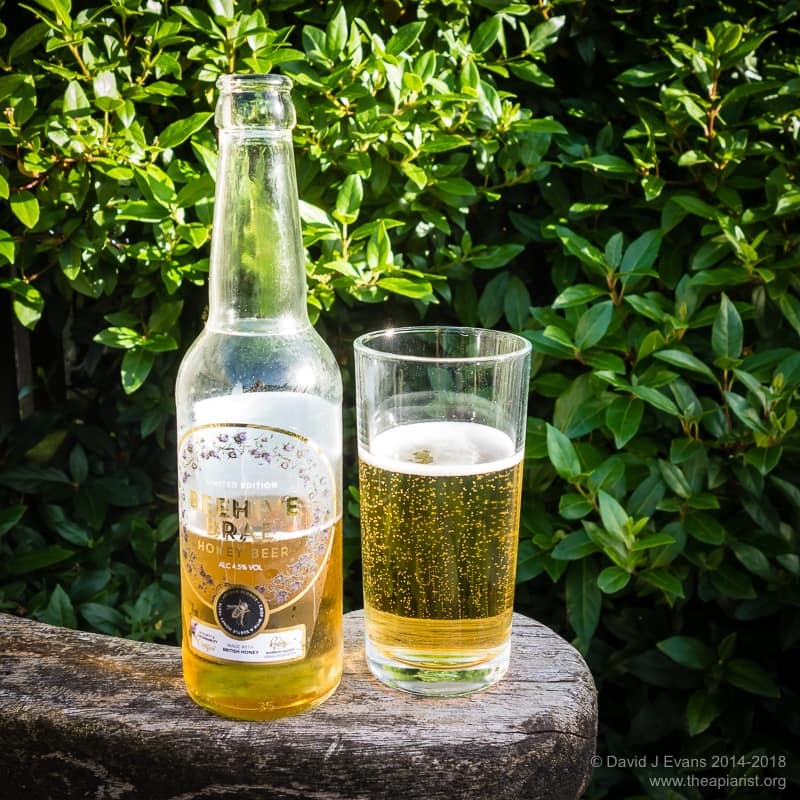 With smaller amounts you can use a breadknife to (carefully … mind your fingers!) cut the block up. It’s a lot easier if the block is at room temperature. For real convenience you can pack plastic food trays with fondant, wrap them in clingfilm and take a couple with you when you visit the apiary. 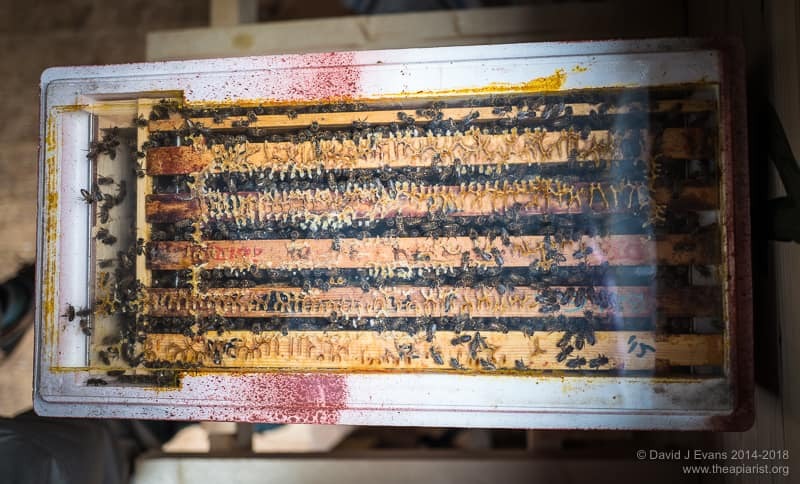 If needed, simply unwrap them and invert them over the top bars of the hive. Large takeaway food containers or one of the many semi-solid types of plastic packaging used by supermarkets are ideal. Tortellini packets are good and just about fit the ekes I’ve built. Finally, remove the clingfilm completely before use. 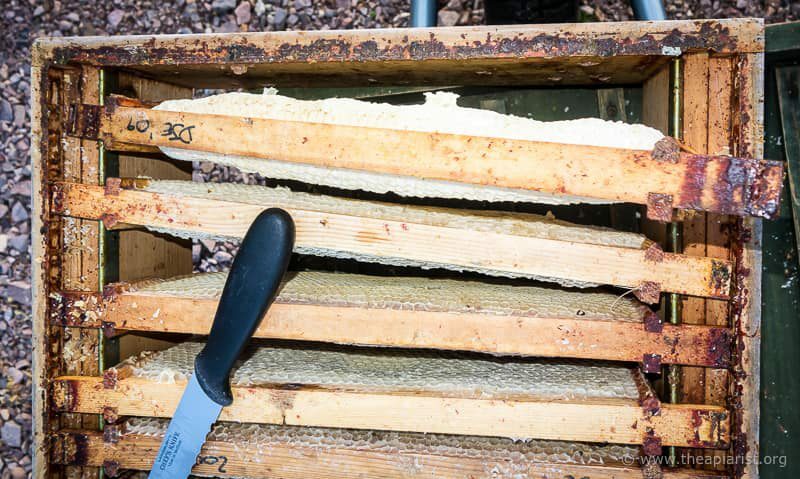 Bees tend to chew through clingfilm and drag it down into the broodnest, even incorporating it into the bits of brace comb they build. Getting rid of the traces of clingfilm during the first spring inspection is a pain, and best avoided. 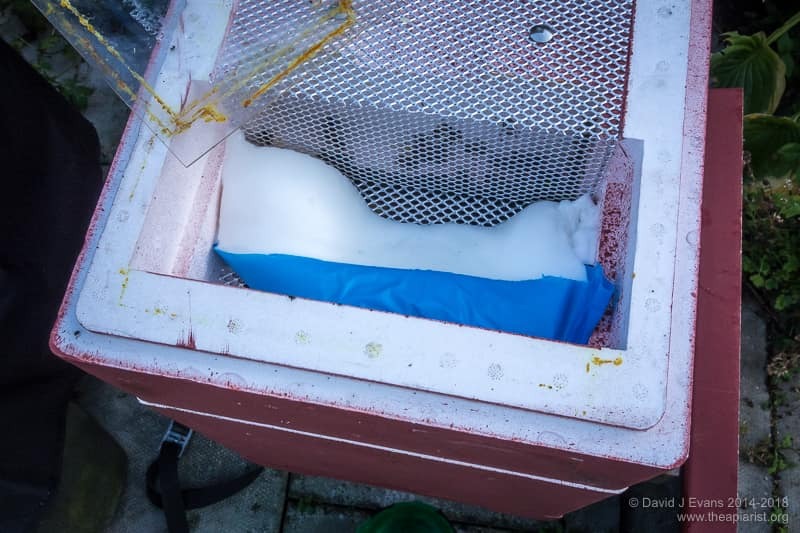 This entry was posted in Beekeeping, Feeding and tagged fast food, fondant, starvation, winter on February 2, 2018 by David. 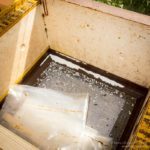 The last colonies to be treated for Varroa this late summer (early autumn?) are those in the bee shed†. 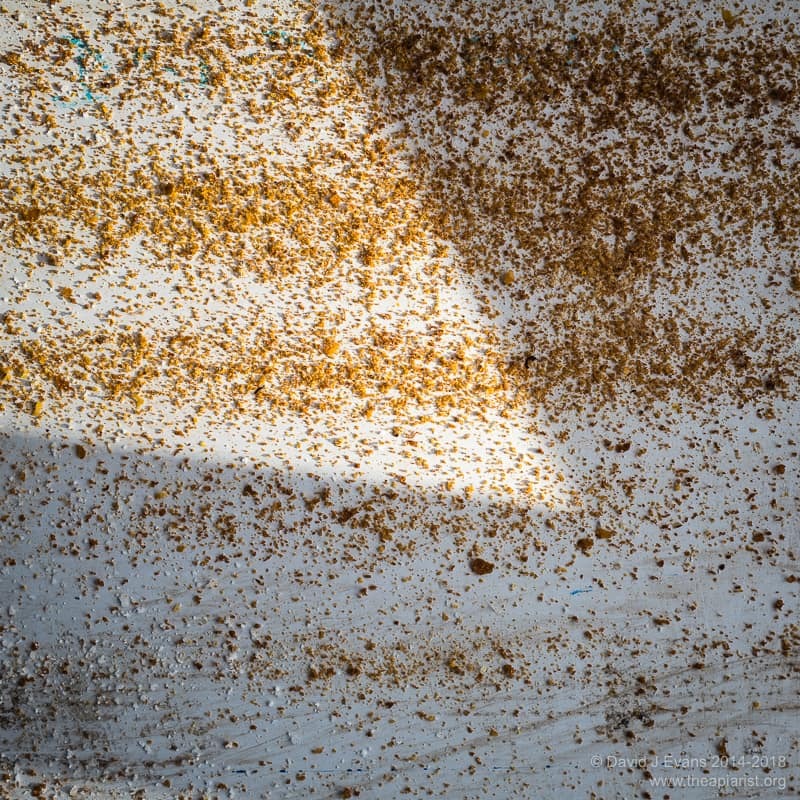 These have had consistently low levels of mites all season … levels were so low that we uncapped two full frames of drone brood (individually) from one of them in June without finding a single mite. mite levels can rise dramatically from low levels if not tackled – for example, see the modelled expansion of the Varroa population. reduced queen laying at this time of year means mites have fewer pupae to target resulting in elevated infestation levels in the critical winter bees (and why this is important). In recent sampling of pupae we’ve seen an increase in the number of mites in capped in cells which we assume is due to this. we need to keep these colonies with the lowest practical mite levels. … they were treated anyway. I’m reasonably confident that sublimated oxalic acid (which is the active ingredient in Api-Bioxal) does little or no harm to the colony, and am sure that the mite reduction is always beneficial. I’d therefore prefer to treat than regret not treating at a later stage in the winter or early next season. There’s nothing fundamentally different about treating colonies in the bee shed than those outside. Using a Sublimox vaporiser is very straightforward. However, two points need a little more care than normal. The second point relates to the ‘leakiness’ of the hive and the fact that it’s in an enclosed space (the shed). 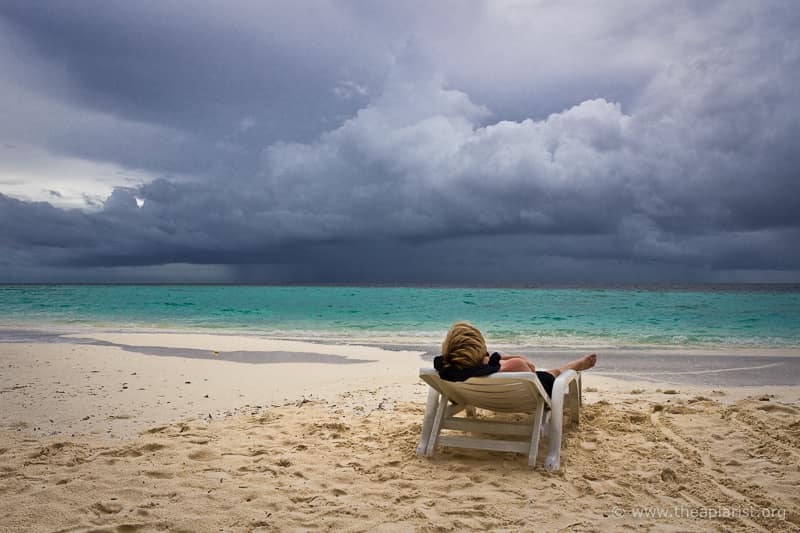 There’s therefore no chance of standing upwind and allowing escaping vapour to drift away safely. Operator protection is particularly important as the shed is liable to fill with oxalic acid vapour. Eye protection and a suitable particle mask rated for acid particulates are essential. It’s a case of “lighting the blue touch paper and retiring to a safe distance”. With a Sublimox you can simply invert the machine – into the ‘delivery’ mode – and leave it hanging out of a hole through the sidewall of the floor (see photo above right). There’s a couple of seconds before sublimation starts which you can use to step out into the fresh air, only returning once the vapour has cleared. † Plus a recalcitrant swarm that’s on it’s second round of treatment due to the stubbornly high mite levels. Grrrr. 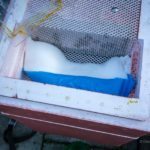 This entry was posted in Bee shed, Beekeeping, Varroa control and tagged Api-Bioxal, bee shed, fondant, oxalic acid, sublimation, sublimox, Varroa on September 23, 2016 by David. Zoom. Having moved back to Scotland in mid-2015 this is my first full season keeping bees here. The season has been very short. Some colonies weren’t inspected until the end of April and now, about 14 weeks later, it’s turned distinctly autumnal over the last week or so in Fife. Nectar flows have pretty much dried up, nights are much cooler and thoughts turn to preparing colonies for the winter. 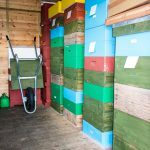 However, good winter preparation with strong, disease-free colonies and low Varroa levels means that, should Spring 2017 be early, the bees will be ready to take advantage of it. 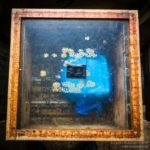 The very best way to protect colonies from robbing – either by other bees or wasps – is to keep them as strong as possible. Wasps can be very troublesome in the autumn. Smaller colonies and nucs are particularly susceptible to attack and can be devastated in just a day or so if not properly looked after. 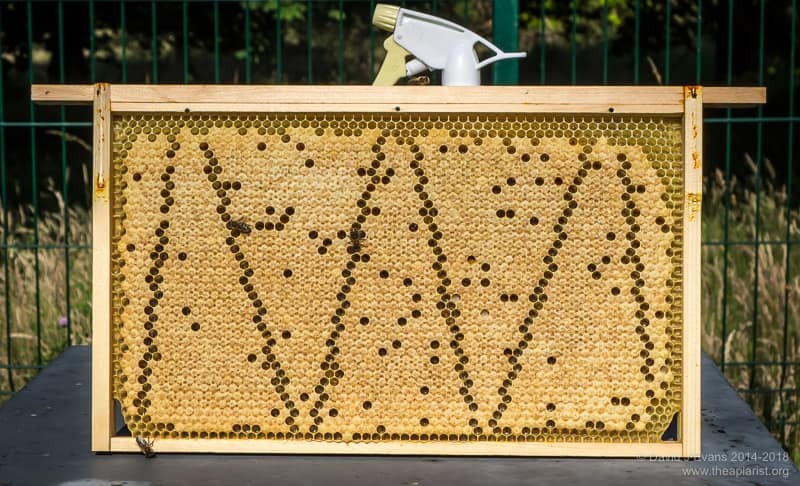 A block of foam or wood can easily be pushed into place on a full hive, reducing the space the bees need to defend. The underfloor entrance of kewl floors (right) have the added advantage of a narrow L-shaped tunnel that can be defended on the landing board and/or immediately below the frames. 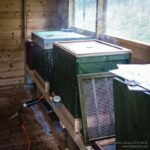 It’s not unusual to have 2-4 frame nucs in mid-August, either being prepared for overwintering or with ‘backup’ queens while re-queening other colonies. If the colonies aren’t really strong enough to defend themselves they need to be given all the help they can. Reducing the entrance space to a single bee width helps a lot, particularly when the entrance is as cavernous as the design on the Thorne’s Everynucs that I use. 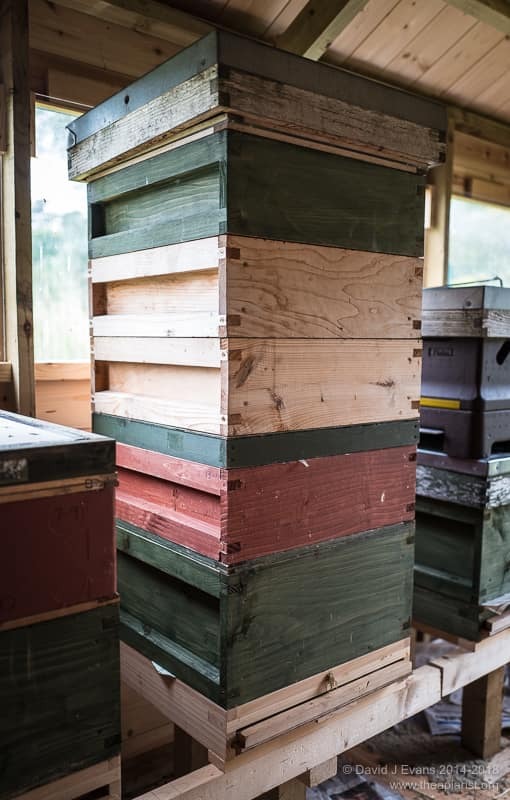 There’s still sufficient time for strong nucs to be built up to occupy a full hive, but they need to be given sufficient space for the queen to lay and will probably require feeding unless there’s a good late-season nectar flow. 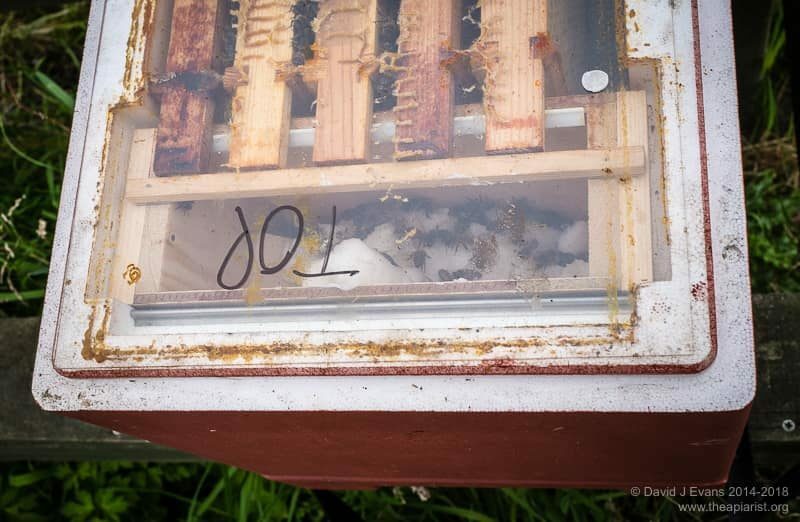 This nuc (below) started the first week of July on just a frame of emerging brood, a frame of stores and a new queen and is just about ready for a full hive. Although not obvious from the picture, the feeder on the left contains a large block of fondant which the bees are busy with. This was added as soon as the flow stopped and before the nuc got dangerously light. The bees might have survived but the queen would have slowed or stopped laying eggs and development of the colony would have been retarded. This nuc is fast running out of space and will be moved into a full hive in the next day or two. 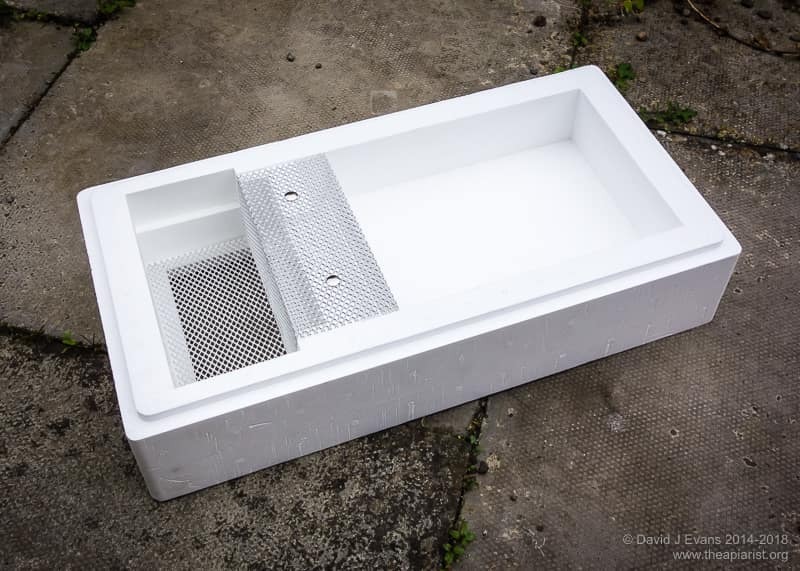 The integral feeder on these Everynucs has space for about a kilo of fondant. 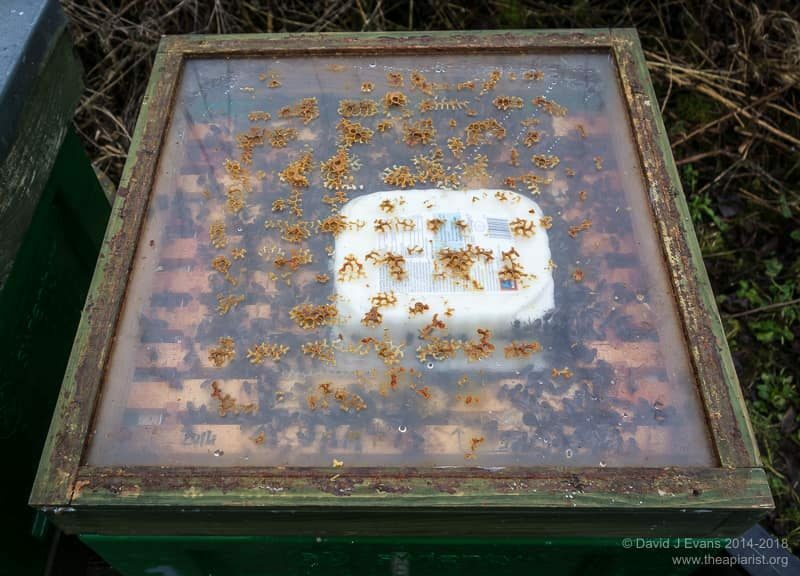 Here’s another nuc started a fortnight ago with a ‘backup’ queen that was also light on stores. The parent colony were showing signs of replacing the queen so I removed her and a couple of frames of emerging brood and left them in the corner of the apiary with the entrance stuffed with grass (to deter the flying bees from returning to the original colony). After a couple of days I removed the dried grass and they’re now ticking along nicely. As they’re a smaller colony and contain predominantly young bees they lack a strong force of foragers and so need regular feeding. If the original colony successfully rears a new queen I’ll have a spare for overwintering. If not I’ll unite them back together at the end of the month. This is the same nuc as shown in the top image with the reduced width entrance. One of the advantages of feeding fondant is there’s no chance of slopping it about and leaving spills to attract wasps to the apiary. 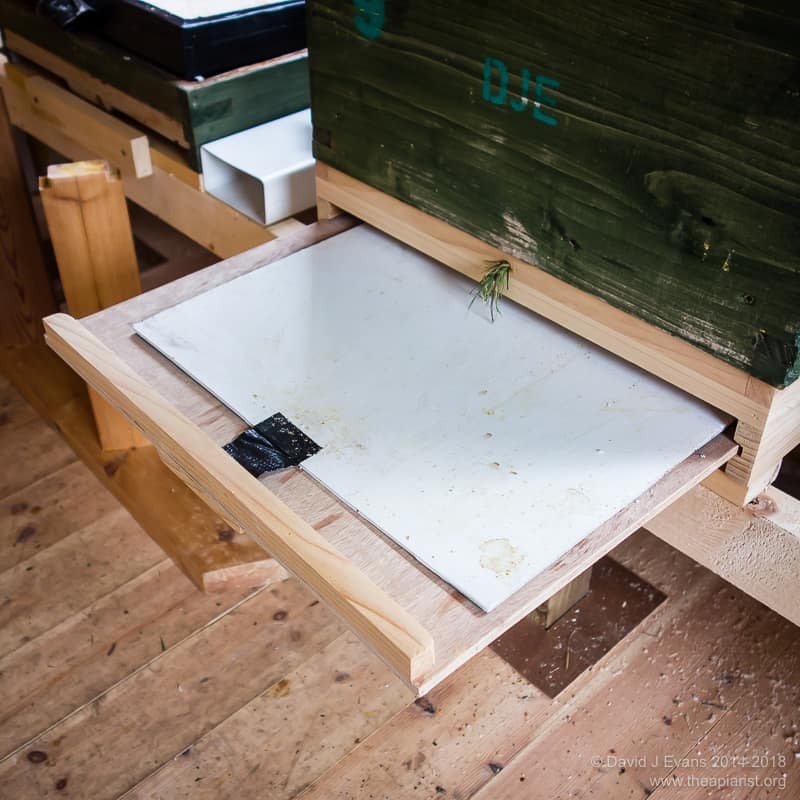 The image above also shows a ‘crossbar’ I add to the Everynuc feeders; this prevents the frames sliding backwards when the nucs are in transit between apiaries. The integral feeder is useful, but it means there’s no ‘stop’ against which the end of the frame topbar can rest. 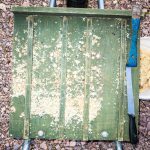 There is a stop fitted across the bottom of the face of the feeder (shown in a previous post) but my experience is that the inevitable jolting of a car journey means the frames lift above this and then can slide about too much with the risk of crushing bees. 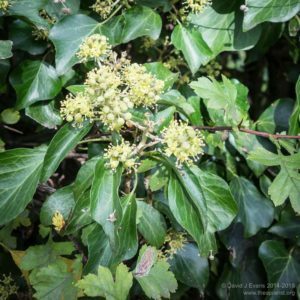 I’m resigned to it being a poor summer for honey this season – a combination of a late spring and consequent slow colony development, variable weather during the summer and an extended queenless period for many colonies due (again) to lousy weather for queen mating. Clearers are now on the majority of colonies with filled supers. I’ll retrieve all the filled frames for extraction and make up new supers with the leftovers (incompletely filled or too high water content). The latter will go back onto strong colonies, either in the hope of a late season top-up from the himalayan balsam or for winter stores. Just retrieving the clip from YouTube means I’ll now be spending half the evening chuckling over other bits of this classic series. This entry was posted in Beekeeping, Seasonal and tagged autumn, Classic 1970's sitcoms, entrances, Everynuc, Fawlty Towers, feeding, floors, fondant, robbing, wasps on August 12, 2016 by David. Beekeepers in Scotland (and possibly elsewhere) should be aware that the continuing cold weather will mean that strong colonies may have dangerously low levels of stores. 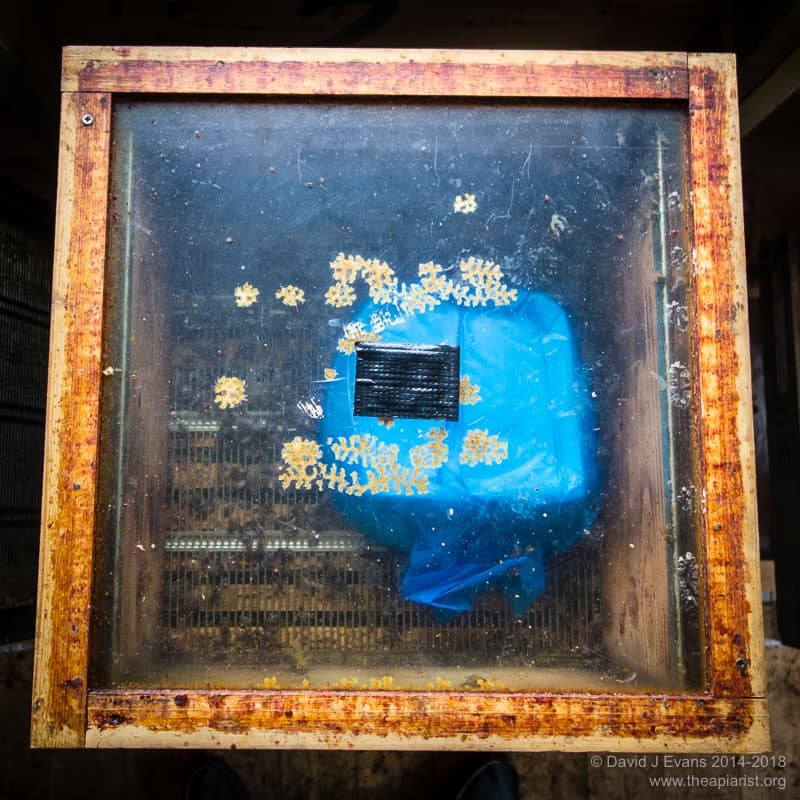 Brood rearing has started in earnest by now and the increased number of larvae mean that stores are depleted at a very much higher rate than a week or two ago. For exactly the same reason, colonies in which the queen fails in the winter or early Spring (see the post in a few days) can often be identified by significant levels of uneaten fondant or stores, even before you open the colony and properly inspect them. I checked two colonies in the bee shed this morning. One is very strong; they’re already at 8+ frames of brood and even managed to store a little nectar in the super during two warm days last week. There are drones already present and more sealed drone cells on the way. There are even a couple of ‘play cups’ in evidence, but no charged queen cells. However, the most important thing that wasn’t present was stores. With the low temperatures predicted to continue for at least the next fortnight there’s a real danger of the colonies starving. I replaced one of the outside frames with a full frame of sealed stores to tide them over for a bit (alternatively I could have added a block of fondant or some thin syrup, but I keep frames of sealed stores for just this type of eventuality). When I next check them I’ll almost certainly give them a second brood box with some drawn comb and a couple more frames of stores. That way the colony can continue to expand without starving and I can use the extra brood to make up nucs for queen mating once the weather improves. 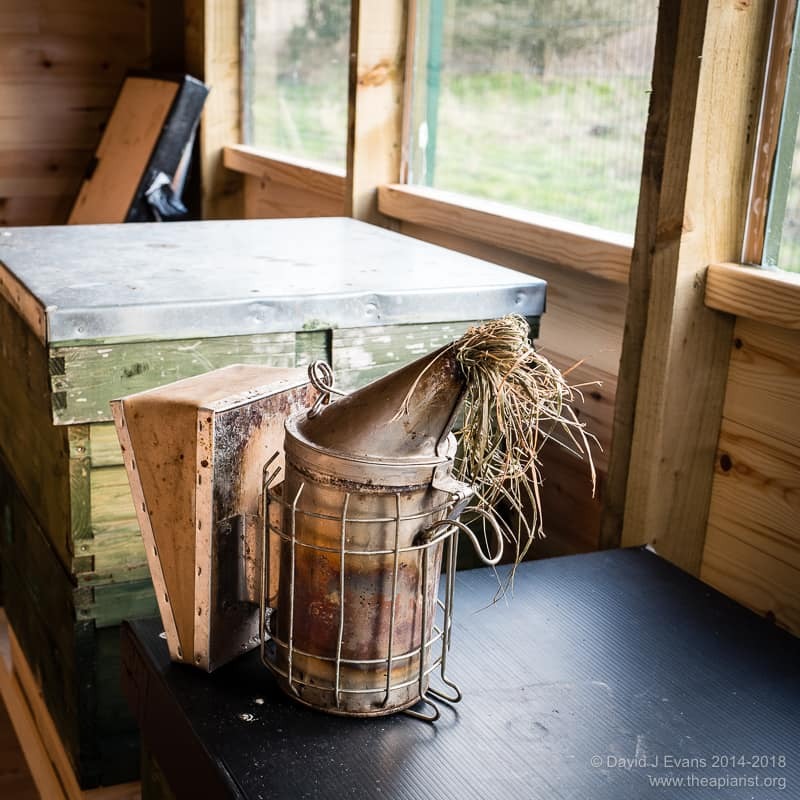 The National Bee Unit have also recently released a warning about the April double-whammy of low food levels and high mite levels … this includes the sentence “Some of you may not have gotten round to treating your colonies with oxalic acid as the weather was so mild in winter“. Anyway, their advice usefully includes ways to control high mite levels at this time of year. This includes Apistan and Amitraz-containing compounds (though resistance to the former is widespread) whereas treatments that are temperature-dependent for efficacy, such as Apiguard and MAQS, should be avoided. 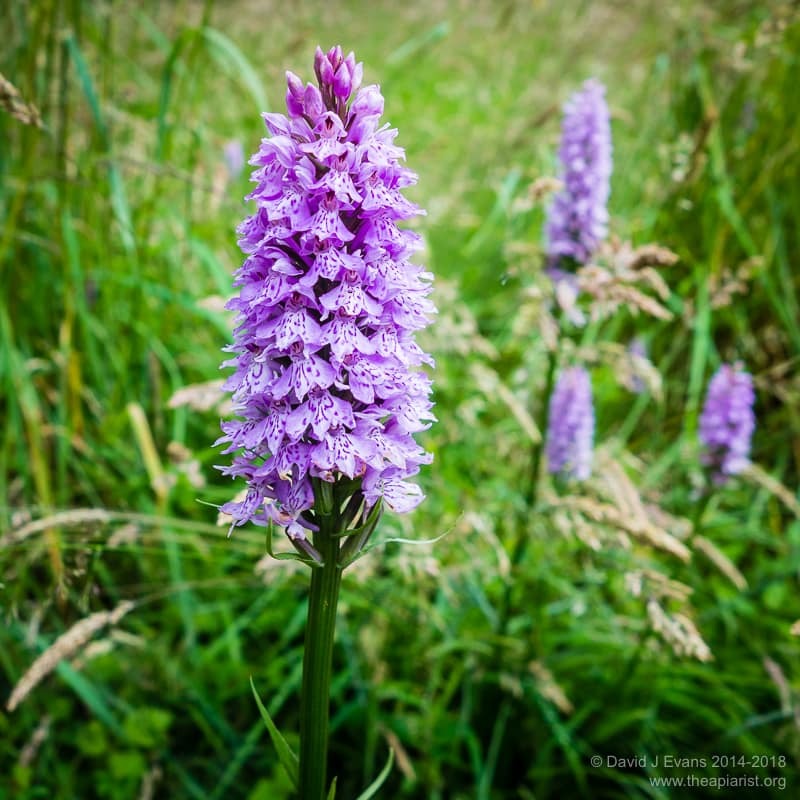 Alternatively, three treatments with vaporised oxalic acid would be effective. The mite levels in the colonies in the bee shed are very closely monitored using Varroa trays in sealed floor units (so none blow away or get dragged off and eaten by creepy-crawlies – mite drop numbers are notoriously poor at giving a proper measure of mite infestation levels). 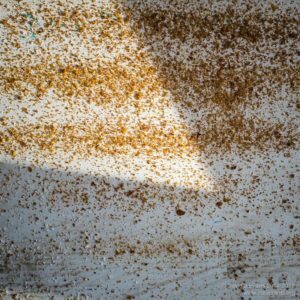 Since the 23rd of February – 62 days ago – the two colonies in the shed have dropped 3 mites each in total. 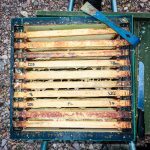 These colonies only received vaporised oxalic acid treatment last season – as early as possible after the honey supers were removed and in midwinter. Frank Loesser wrote Baby, it’s cold outside in 1944 and it was performed by Esther Williams and Ricardo Montalbán in the 1949 film Neptune’s daughter – see the clip from the original film at the top of the page. 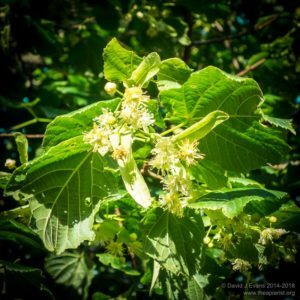 This entry was posted in Beekeeping, Feeding, Seasonal and tagged brood, fondant, old songs, spring, starvation, stores on April 25, 2016 by David. 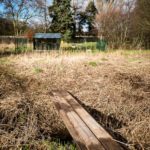 The apiary occupies a sheltered and sunny corner of open woodland, access is restricted – not least because the bridge is still pretty precarious – and it’s not possible to get a car particularly close to the site. 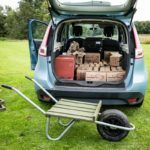 Therefore everything of any size has to be wheeled there on Buster, my (t)rusty hivebarrow. It’s easy to jump across the burn – after all, the deer do it all the time – but I need the bridge for the hivebarrow. The apiary includes my bee shed, a 12 x 8 foot sturdy shed built onto a solid, level, slabbed foundation. The side of the shed that gets the morning sun has large bee-friendly windows. 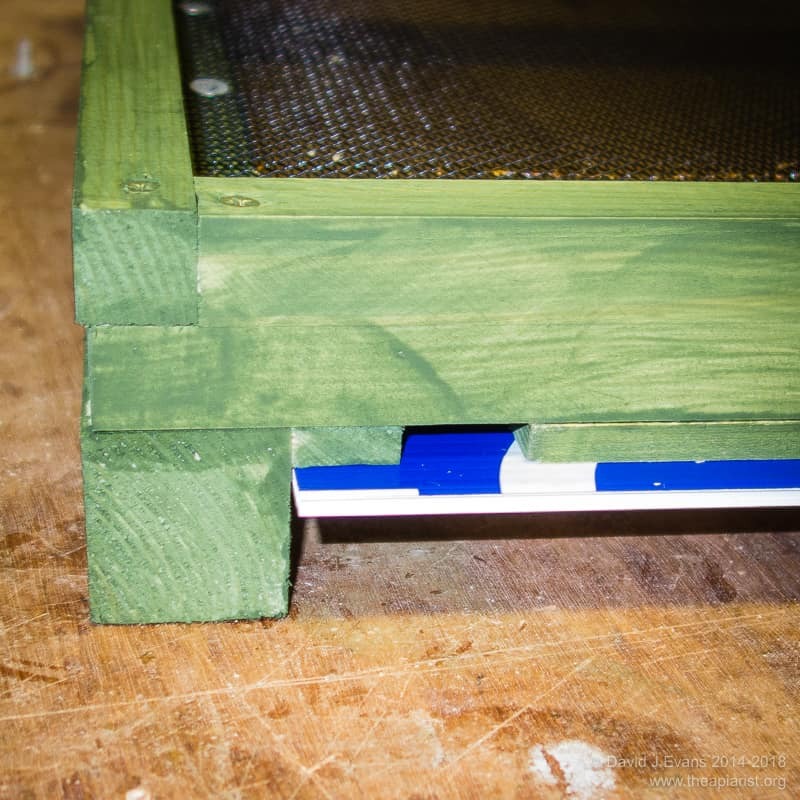 Inside, there’s a secure set of hive stands that are fixed, not to the shed, but to the underlying slabbed foundation. This ensures that vibrations caused by me wandering around inside the shed aren’t transmitted to the bees by the continued flexing of the floor. 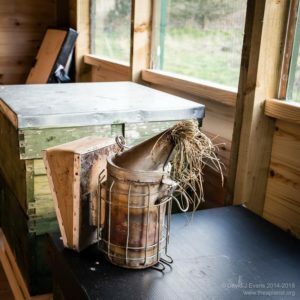 If you jump and land heavily on both feet in the shed the bees give a small roar of recognition/agitation. However, since I don’t normally pogo around my hives this isn’t an issue … during normal bumbling around the colonies they’re silent. 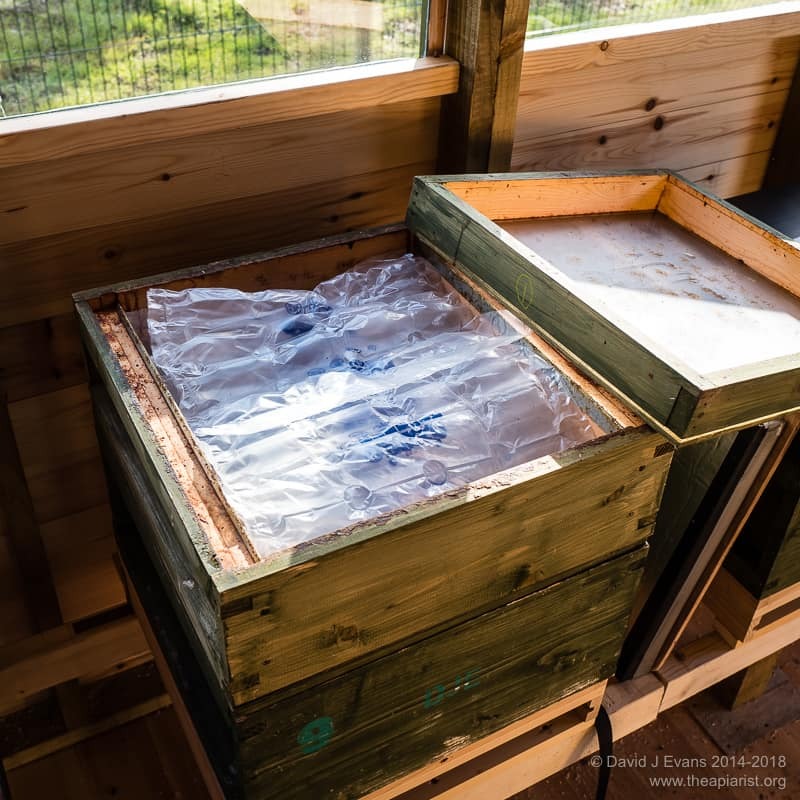 I’m new to bee sheds, so am still learning … time will tell whether the modifications I’ve made to help house the hives – largely suggested by generous contributors to the SBAi, gleaned from the internet or simply guessed at – are suitable. 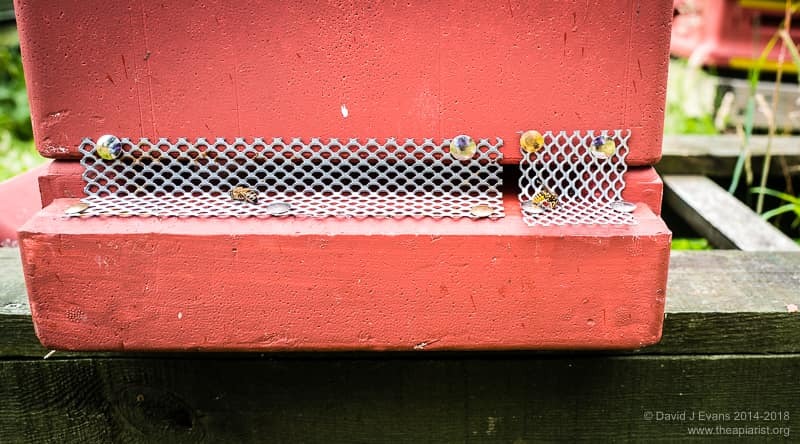 For example, the hive floors are currently bolted onto the hive stands to avoid my inevitable engulfment in escaped bees if one were to get bumped inadvertently. In some bee sheds I’ve read the hive entrances are simply lined up with a hole in the shed wall. 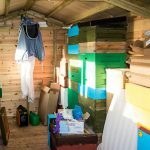 However, for a variety of reasons I and others want to be able to work in the shed without beesuits, so I have entrance tunnels that connect the floor to the shed wall. 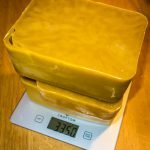 Several of my colonies had still not finished with their fondant blocks by late into November. 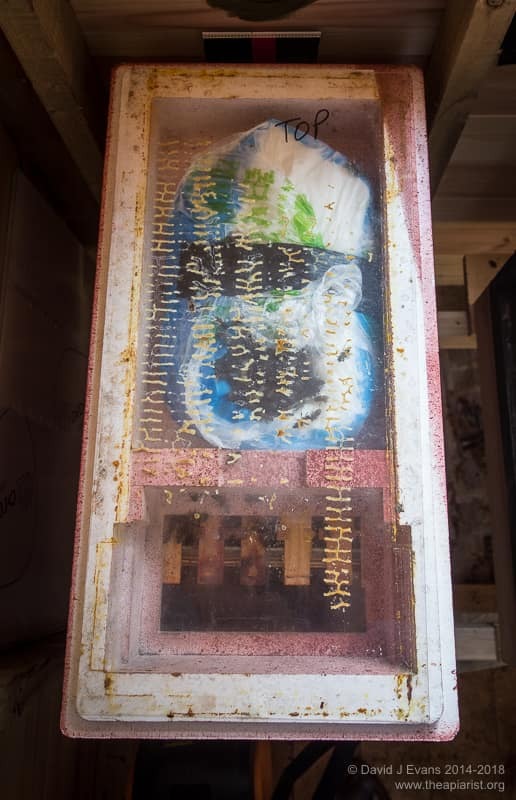 These blocks had been housed over a queen excluder in an empty super, underneath the usual insulated perspex crownboard. To avoid a dead space above the colony I filled the super with some of that ‘inflated’ sealed plastic bag wrapping often supplied with packages from Amazon or similar mail-order suppliers. Bubblewrap can be used in the same way. 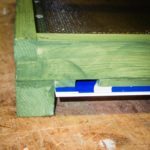 This entry was posted in Bee shed, Beekeeping, Seasonal and tagged bee house, bee shed, bridge, fondant, roe deer, Varroa, winter on February 26, 2016 by David.